Carnage. Chaos. Two words being thrown around a lot in the pits of the 40th Toyota Pro/Celebrity Grand Prix, part of the Long Beach Grand Prix weekend now underway (Aprl 15-17th, 2016). 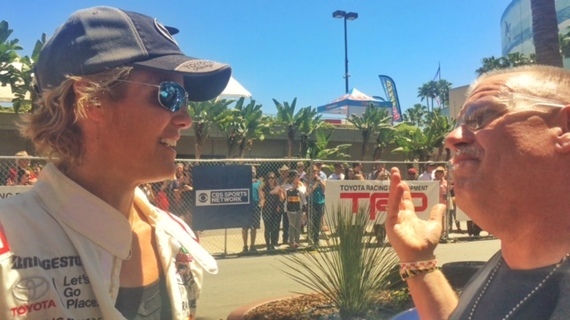 "I've run this race a few times, and I saw more action in the first two laps than in all of the other races combined," actor William Fichtner told me at the conclusion of this, the final Toyota Pro/Celebrity Grand Prix. Like many of the celebrities and Pros in Saturday the 16th's race, it was a bittersweet time. 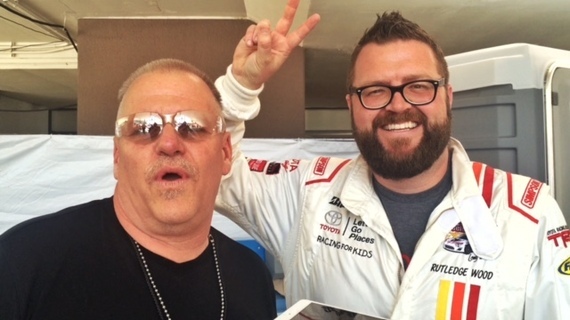 "I can't thank you enough for all the support you've given this race over the years," Top Gear personality Rutledge Wood said as we hugged before the race. It's was a surprising emotional time. "This race, the Miller's Children Hospital and Racing For Kids has given millions over the years to help kids and families that need it most, it's why we all come back, it's why we're all here every year," Rudge continued. "I've had the chance to race along side people like Unser, Vasser and world class racers, all the while playing race car driver. We've become a family of sort, each year a reunion to have a blast and race money for kids at the beach. It's been such a joy," he added. 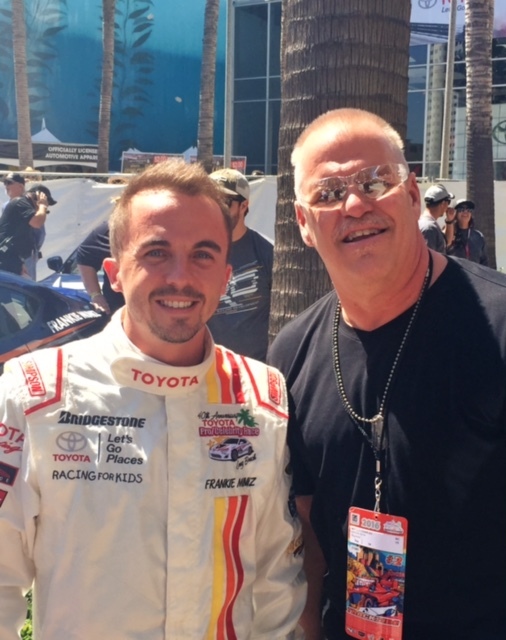 The sentiments were echoed by everyone, including Frankie Muniz, TV and film star and now, racer. "I really developed a love for racing over the years of this race, and remember, I had to wait to be old enough to run the race. But once I did, the racing bug bit me hard. I finished second yesterday in the pole position qualifying trials, but they inverted the grid, so I begin in the back," he said with true disappointment in his voice. He wants to win. They all do. As fun as it is, as much good as it does, it's a race and actors, pros, celebs are often very competitive. However being in the back may have kept him out of harm's way, as this year's Toyota Pro/Celebrity Grand Prix proved almost as thrilling as the other races going on over this action-packed weekends on the streets. The Red Flag was raised and the race was stopped until it was cleared. The man that was struck appeared to be OK as the paramedics responded as did all three drivers, but it provided for some of the highest drama this race has ever seen. 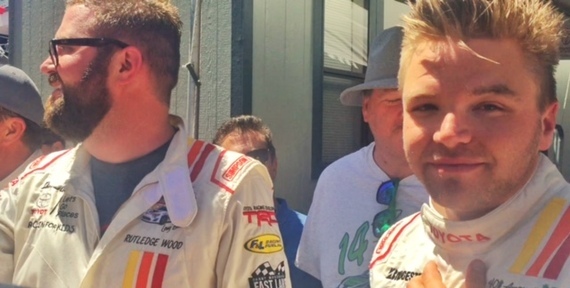 "The fact that we are all walking away is a testament to the safety of these Toyota Race cars," Flanery told me. "It was a hard hit," when asked if it felt as dramatic as it looked. "It was a very hard hit and I really just wanted to make sure everyone involved was OK. I mean, this is racing, we got two laps in, these things happen. But you always want everyone to walk away unharmed," he added. When all was said and done "Fresh Prince's" Alfonso Ribeiro, a returning now four-time champion, won by a hefty margin. Ribeiro has taken to racing as well after his experiences on the streets of Long Beach. Olympian Dara Torres was leading until she was clipped and spun out near the end. "What a way to end the run of this race," she said getting out of her car in the pits after the race. She has 12 Olympic medals at at 49 is almost an elder statesman. The announcer reminded the audience she is the only woman in the field this year and when I brought that up she laughed. "The car doesn't care if you're a man or a woman, it doesn't know. The track doesn't know. As with everything it's how you perform, your abilities and skills that are important. But racing is an area that women have yet to make the major inroads we have in other sports," she added. So why is it the last Toyota Pro/Celebrity Grand Prix? It appears California is losing another major company to Texas, as Toyota is going to move their world operations headquarters from Torrance, CA to Plano, TX. This will mean the logistics to put on such a race simply won't be in the area any more. And while every star or Pro on the platform, an audience alike, voiced a desire to keep the race going, it's no small commitment. Toyota has helped raise over $2.3 million for kids with cancer and other diseases at Miller Children's Hospital. I couldn't help but feel the weekend was losing something as I sat in the compound for the last time, watching pro racers and celebrities mix it up for charity. Toyota is still the sponsor of the Long Beach Grand Prix itself, but the weekend's shine will be just a little less bright with the loss of the stars. Of course, the weekend is really about stars of the Grand Prix circuit, and that racing promises to continue on in to Sunday. The actual Grand Prix gets underway Sunday April 17th at 1:30, the third race of the 2016 Verizon Indy Car Series. The Lifestyle Expo is open for families on both days, drivers are giving autographs and Cheap Trick was the featured Saturday Night band for Rock-n-Roar. The drift challenges remain a strong draw as well and began the weekend before continuing through. 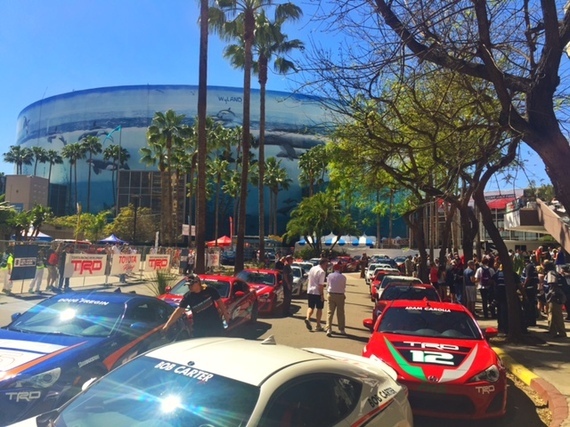 The Toyota Grand Prix of Long Beach has grown from a racing event to a multi-faceted event for racing fans and simple good-time enthusiasts. There was an E-Prix this year, for electric vehicles, a Stadium Super Truck Race for the Bubba's in all of us and even an exotic car parade. But there's nothing like watching some of our favorite celebrities actual race on the track against each other. It's been a great asset, starting just two years after the original Grand Prix (42 this year, to the 40 Pro/Celebrity) and it's an event that will be missed. To find out more go to Long Beach Grand Prix.